Thanks to Oscilent for permission permission to reprint this article! The purpose of this article is to discuss the important design considerations and development limitations of a Radio Frequency and Surface Acoustic Wave (SAW) Filter (Both IF Filter and RF Filter). Each of the major Electrical Parameters are discussed from a development perspective as follows (reference Figure 1 for further definition): We will also be reviewing RF Filter electrical components from this page. Although certain design adjustments can result in a SAW Filter outside this parameter, the general frequency range for a commercial application SAW Filter is from 30.00MHz to 2.60GHz. The available frequency range is determined not only by limitations presented by the material used for the wafer, but also by the SAW Filter manufacturer’s equipment for production. Most SAW Filter manufacturers will invest in equipment to produce the standard commercial range, and Oscilent Corporation falls into this group. 36~49 degree LiTaO3 (36/49 LT) wafer. 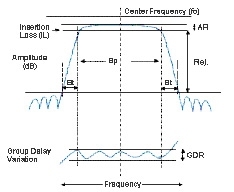 The Fractional Bandwidth capability is 5 ~ 7% of Center Frequency. Design Goal: High Loss with narrow Bandwidth, but good Ripple Characteristics. Matching required to be 50ohm. 2. 112 degree LiTaO3 wafer (112 LT). The Fractional Bandwidth capability is 0.6 ~ 1.0% of Center Frequency. 3. Design Goal: Moderate Loss, Wide Bandwidth, Matching required to be 50ohm. 128 degree LiNbO3 (128 LN) wafer. The Fractional Bandwidth capability is 4 ~ 6% of Center Frequency. 4. Design Goal: Wide Bandwidth, low loss but high ripple characteristics. 64 degree LiNbO3 wafer(64 LN). The Fractional Bandwidth capability is 8 ~ 10% of Center Frequency. 5. Design Goal: High Loss, narrow Bandwidth with low Ripple Characteristics. Matching required. ST cut Quartz wafer (Qz). The Fractional Bandwidth capability is 0.1 ~ 0.2% of Center Frequency. As seen above, the Ripple Specification is largely determined by the material used in the design of the device. Secondarily, the Ripple can be controlled by design considerations, but generally speaking, as the Band becomes wider, the resulting effect will be an increased allotment for the Ripple characteristics in the final Specification. The Group Delay is represented by the slope of the Phase vs. Frequency Curve. The Group Delay parameter in a SAW Filter Specification represents the time it takes for the signal to pass through the SAW Filter. The end user is concerned about total Group Delay in the system because, when Group Delay is higher, this can introduce phase errors in digital coding. When developing a SAW Filter, the design engineer considers the size and length of the filter to limit the Group Delay as much as possible. Sometimes called the “skirts,” the Transition Bandwidth is found by the difference between the 40dB Bandwidth and the 3dB Bandwidth. For example, in case of 10MHz at 40dB Bandwidth, and 5Mhz at 3dB bandwidth, the Transition Bandwidth is 5 MHz expressed as +/- 2.5MHz. The design engineer will attempt to limit the Transition Bandwidth Specification as much as possible because the result is a “sharper” filter. The Rejection Specification of the SAW Filter is defined by all ranges minus the Passband. As the Rejection of the SAW Filter is increased, this increase reduces noise out of the Band thereby producing better functionality. This function must be balanced against overall Loss of the Filter since the Rejection and Loss of the SAW Filter are direct tradeoffs in the design. The task at hand for a SAW Filter design Engineer is to understand the application so as to recommend the best balance between the these two Electrical Parameters. Characteristics of the substrate material (see Passband Width above), and the Rejection requirements of the SAW Filter design (see Rejection discussion above). The Insertion Loss characteristics will increase when approaching the outer boundary of the Fractional Bandwidth limits of the materials used, and when the Rejection Spec is increased. In other words, the wider the Bandwidth and higher Rejection, the more must be sacrificed (or taken) from the Insertion Loss Electrical Parameter. Therefore, the goal of the design Engineer is to balance these characteristics in order to increase gain as much as possible thereby eliminating the need for a higher power amplifiers and potential greater amount of matching components in the Saw Filter circuit.